Before we found some personal friends in Papua New Guinea, this is the coffee we used to rely on. Awesome folks even though at the time we had never met them. One of the few Estate produced coffees (a bit smaller than Carpenter) and located just a couple miles down the road. A couple years back times were rough with Kimel, PNG is a tribal land and not all the tribes get along all the time. To have an estate in PNG means you have to have an open environment between the tribes living/working on or near the estate. Unfortunately Kimel had a rough couple of years due to some tribal conflicts and coffee production and quality wavered pretty good. This is when we started working direct with Carpenter Estates and found some absolute gems of beans. When I got this years Kimel AA sample though some friends, we couldn’t help but to pick it up. Great screen, super clean cup profile. A bit milder and sweeter than last years Sigri. Plus it got here earlier, our Carpenter Estate beans are still a week or two away. Medium bodied, low acidity and a clean cup. Perfect example of what a premium PNG should taste like. Not super jazzy but great prep and carries the tastes PNG fans are looking for. Smooth chocolate, bigger body and low acidity. Hard not to enjoy this cup. Lighter roasts are milder and sweeter, not quite the heft of the medium to dark roasts but tasty. Medium roasts bring out a bigger body and stronger chocolaty tones, turns a bit more semi-sweet as one gets real close to 2nd crack. Dark roasts get smoky and thicker with a little bitter edge to it. Although traditionally PNG coffees are taken a little darker, go a shade lighter that you think. We thought a city + roast was wonderful. Smooth, sweet and more down the milk chocolate alley. Maybe a little hint of acidity lighter but with a 2-3 day setup, it will be gone. Darker roasts work great with this bean but turn it stronger, loses its delicate tones and shows more Indo style tones into 2nd crack. 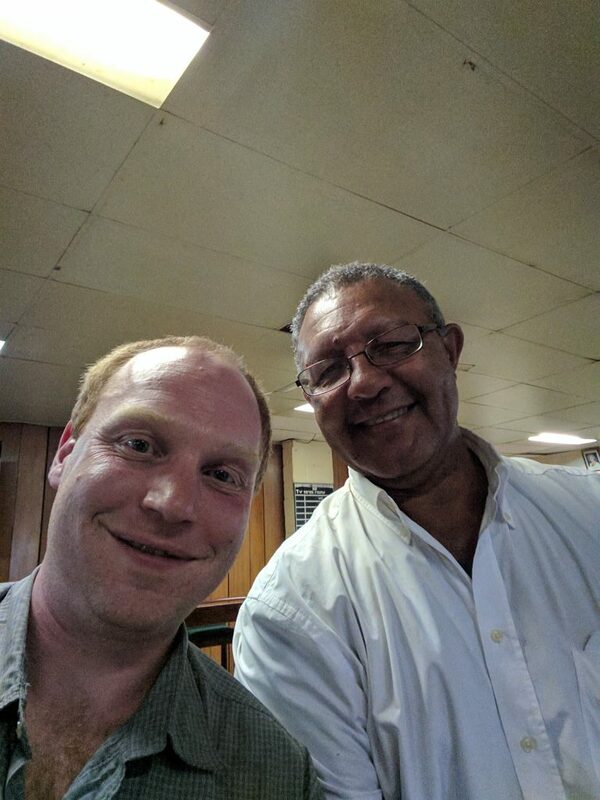 Not my best picture but I spent a lovely evening at the Mt Hagen Club talking with Brian (Kimel Estate Manager) about our mutual passion for coffee.